Like any high-tech community, TiVo users are eager to share information, experiences, tips, and troubleshooting online. A few communities have developed where TiVo users can post questions, screenshots, and all manner of TiVo gossip. TiVo Community - This website is the largest meeting place for TiVo users. With literally millions of posts, and many TiVo experts who have each individually posted in the tens of thousands of responses, any information about TiVos can usually be found here. This site has literally millions of posts covering the entire TiVo landscape. At times, even employees of TiVo post here. This site was originally part of AVSForum, and was recently sold to Capable Networks, an owner of several tech forums. 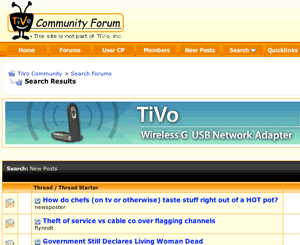 TiVo Forums - TiVo runs and operates this site. 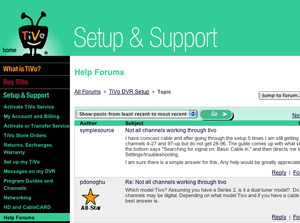 This forum is primarily focused on basic troubleshooting: how to set up your new TiVo, how to connect it to a network, etc. Several knowledgeable TiVo fans tend to spend time here helping new users. In addition, some TiVo engineers post here from time to time. This forum is pretty focused on getting business done, generally for new users. Not a lot of browsing here - strict q&a. WeaKnees TiVo Forums - A forum supported by WeaKnees, the largest company selling TiVo DVRs, upgraded units, upgrades, and parts. This forum focuses almost exclusively on TiVo products, and, alone among the forums, is generally a place where posts are answered by personnel from the company. For TiVo upgrade questions, this is really the best place to post. 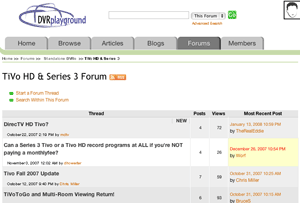 DVRPlayground - Another large forum for all brands of DVRs. Also owned by Capable Networks. This forum hasn't seen a lot of traffic lately as the company is generally more focused on the targeted forum it runs in this area: TiVoCommunity.com. 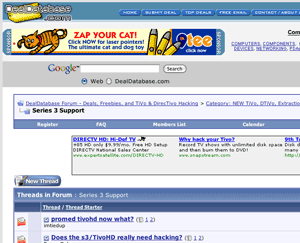 DealDatabase - A forum primarily oriented toward Linux hackers. This forum has a strange history and evolution, but it remains a place where all of the unofficial questions can be answered. Due to its tech-heavy focus, many newer posters are dealt harsh replies.